Details Bone black is an impure black carbon pigment prepared from charring animal bones. Bone black is described in literature as being a deep blue-black to brown black color. It is composed of about 10% to 20% carbon and 80% calcium phosphate along with smaller amounts of other inorganic minerals. A fine particle size and high carbon content grade of bone black is sold commercially as ivory black. Numerous identifications of bone black are reported in literature. Bone black has been identified in prehistoric paintings and found in Egyptian, Greek and Roman art. It is found throughout European medieval and Renaissance art and later in both oil and watercolor paintings until modern times. Many old masters used bone black in their work. In Rembrandt's paintings, the dark-colored umbers night have been almost enough for the background shadows, but the black clothing worn by his sitters called for an intense black pigment. Bone black is animal charcoal prepared from bones, which have been exposed to high temperatures (550° C.) without access of air. The bones are roasted in closed vessels. The residue of the ignition is a black matter, which, when reduced to powder, forms bone black, sometimes incorrectly called ivory black. Ivory by carbonization will furnish a black, which, on account of its fineness and intensely black color, is more esteemed than the ordinary bone black, but it is much more expensive and largely unavailable today. In manufacturing bone black, the bones are first boiled in water or a solvent to remove the fat and then subjected to destructive distillation in closed containers, vented to remove the ammonia, called bone-spirit, together with a dark tarry liquid (bone-oil). When the bones cease to release vapors, the residue is charred bone or bone black. Bone consists of protein collagen with inorganic matter. As a result of the decomposition of the animal matter in this destructive distillation, the nitrogen and hydrogen, united as ammonia, and a part of the charcoal, in the form of carbonic acid gas, distill over, while the remainder of the charcoal is left in the closed containers. 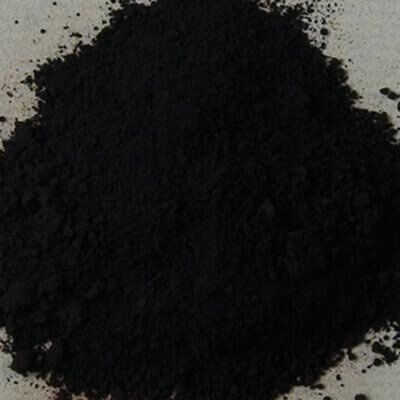 Carbon pigments formed by the pyrolysis of animal matter, such as ivory black and bone black, fall within the category of cokes as the protein collagen softens or liquefies before charring. Cokes are defined as a carbonized matter from a precursor in a liquid or plastic state. They thus do not show evidence of their former structure but rather form irregular, porous lumps. Ivory and bone contain a high percentage of inorganic matter, elephant ivory about 55%. The inorganic components of this latter material are comprised of calcium phosphate (82%), magnesium phosphate (15%), and calcium phosphate (2%), and consequently the pigments formed from these contain an even higher proportion of inorganic material, mostly as hydroxyapatite, Ca5(OH)(PO4)3. 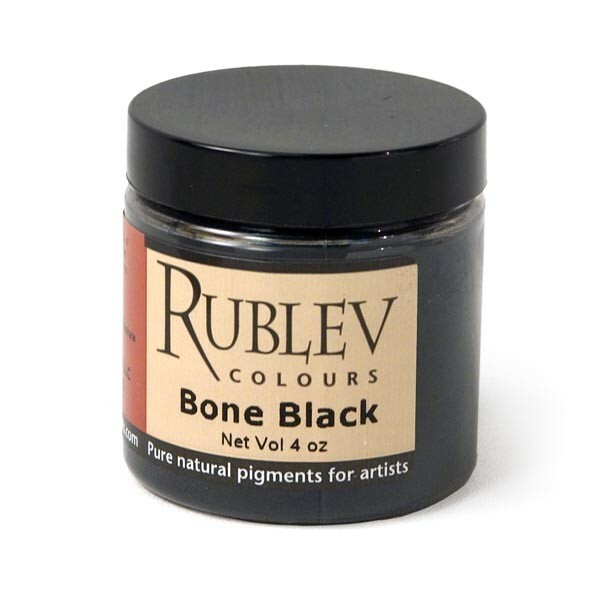 Bone black is a permanent color for all uses on the artist's palette. The stable blue-black pigment is denser than carbon black and has a good working quality for oil paints and watercolors. It is compatible with all other pigments and can be used with good results in all mediums.